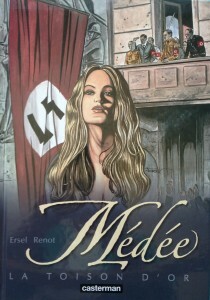 Médée: La Toison D’Or—Medea: The Golden Fleece by Ersel and Renot is an illustrated story that would delight anyone interested in Nazis and the occult, World War II, or the bandes dessinée genre, in general. Medea (Médée in French) of Greek mythology was daughter of the Sun God and wife of the hero, Jason. She is often depicted as an enchantress or a priestess. The story in Ersel and Renot’s book adheres loosely to this theme, and includes many flashbacks to ancient times. 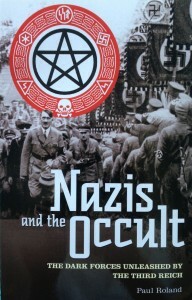 The story in a nutshell: Begin in 1934 at a secret meeting of occultists, not far from Brussels. Their leader is killed by the mysterious Medea (who is able to move back and forth in time). A bishop at the Vatican sends a priest (named Jason!) to investigate a certain Berlin antiquary while Medea is making investigations of her own. Some flashbacks show Judas Iscariot (of Biblical fame) being healed in the wilderness by Medea. One sees the symbols: the lion and the eagle. They reoccur throughout the book. Then back to the Nazis and Reinhard Heydrich himself (by page 18). Berlin 1938: the night before Kristallnacht—‘Night of Broken Glass’ when Nazi stormtroopers smashed Jewish shops and attacked their owners. A Jewish-owned antiquarian bookshop is burned down, but Medea rescues the codex—the ancient manuscript containing secrets of the ritual of the Golden Fleece. Further murders, and a drive-by appearance by Benito Mussolini, lead to Gestapo headquarters, number 8 Prinz Albrechtstrasse. The last act occurs at Wewelsburg Castle, where the modern Medea strips down to enact the ritual with the modern Jason. Reichsfuehrer Himmler arrives, anxious to avail himself of the power of the Golden Fleece. The subsequent fire and brimstone is reminiscent of the final scene between Indiana Jones and the Nazis in Raiders of the Lost Arc. Since the end of the Second World War, Nazi obsession with the occult has become a reoccurring theme in fiction and nonfiction, alike. For a recent example, see the book by Paul Roland, Nazis and the Occult: The dark forces unleashed by the Third Reich (Arcturus, 2012). Roland (from page 323 on) discusses Wewelsburg Castle, describing how Himmler furnished it as a Germanic Camelot, complete with a round table and twelve seats for his Obergruppenfuehrer ‘knights’. A sign of the zodiac was carved onto the back of each chair, while the crypt below was renovated to house the tombs of the valiant, those SS leaders who would fall in defence of Hitler’s 1,000-year Reich. This entry was posted in Vignette and tagged bande dessinee, Heydrich, Kristallnacht, Medea, Medee, Wewelsburg Castle. Bookmark the permalink.